Before making decisions about fiscal policies, a country’s authorities should assess the number of years that natural resources can be expected to generate revenues. Calculating a resource horizon for these extractive industries can be difficult, however, because new discoveries can be made and technological changes can affect the market value of natural resources by making them easier to extract or by increasing the portion that can be recovered. 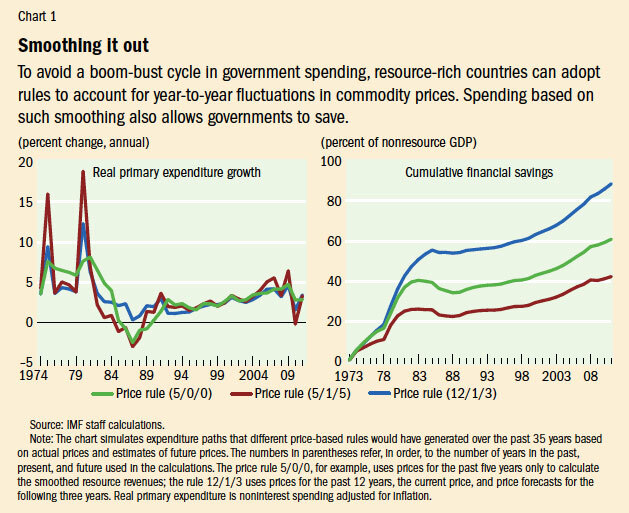 Thus, managing resource price volatility is the most important objective of fiscal policy in countries that have long resource horizons and that depend heavily on revenue from those resources. To ensure that spending and tax policies reflect long-term average revenues, the authorities can adopt rules to account for year-to-year fluctuations in resource prices. 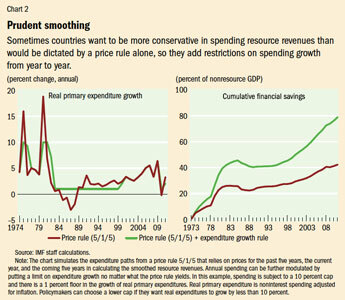 Such smoothing in estimating the structural (or normal) revenues that can be anticipated in an average year allows the authorities to determine how much of their resource revenues they can safely spend through the annual budget. Estimates of structural resource revenues use both a price-smoothing formula and production forecasts and are based on past, current, and expected future prices. Chart 1 shows how different variations of the rule (such as the number of years given to past, current, and expected prices to calculate structural revenues) produce different projections for primary expenditure growth and the accumulation of financial assets. 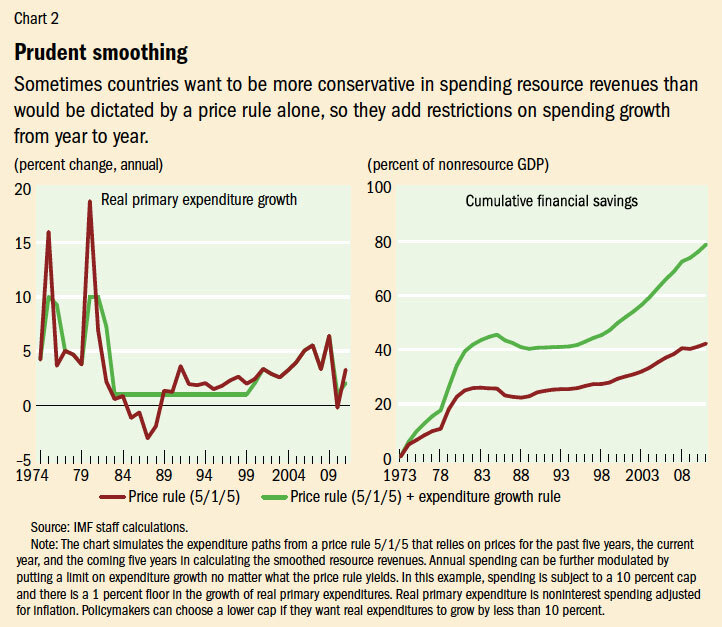 When resource revenues are higher than budgeted, the excess is saved rather than spent. Similarly, the government can draw down its financial assets when budgeted revenues are lower than expected. The fiscal frameworks in Norway, Timor-Leste, and Papua New Guinea are broadly based on this approach. 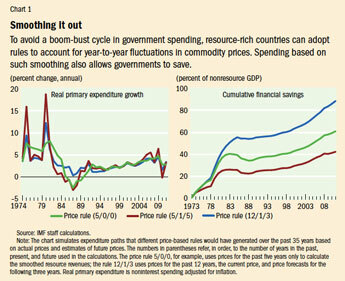 In this way, governments can avoid boom-bust swings in spending driven by fluctuations in global commodity prices. Philip Daniel is an Adviser, Sanjeev Gupta is Deputy Director, and Todd Mattina and Alex Segura-Ubiergo are Deputy Division Chiefs, all in the IMF’s Fiscal Affairs Department.